Obama speech on extremism draws partisan reaction; Ello names first CMO; More investors back Uber. 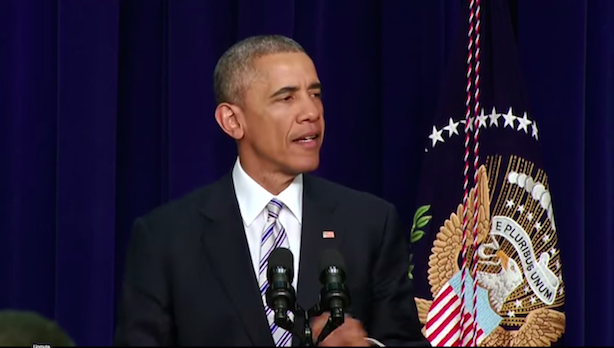 President Obama speaks about combatting extremism on Wednesday. 1. The reaction to President Obama’s Wednesday speech on extremism drew a decidedly partisan reaction, with Fox News focusing on a statement that terrorists have "grievances" and sister outlet the New York Post running an incendiary cover with a blindfolded Obama. Politico says the address irked both sides of the aisle, though mostly those on the right, who deemed it not tough enough on Islam. Early GOP 2016 frontrunner Jeb Bush made his first foreign policy speech of the pre-campaign season on Wednesday, calling for a tougher line on ISIS and Russia. 2. Ello has named its first CMO: Rene Alegria, who previously worked at HarperCollins and founded Mamiverse. He will oversee both marketing and communications at the social network. 3. Uber has expanded its latest funding round, hoping to raise as much as $2.8 billion from investors, despite a year of often bad and sometimes terrible headlines. 4. Former Fortune editor Andy Serwer is joining Yahoo Finance as editor-in-chief. He left the business magazine last year. Yahoo says it plans to expand its financial portal via more video content and events. 5. An NFL official who reportedly handed a New England Patriots stadium employee a football to be put into play in the AFC Championship is now at the center of the "deflategate" investigation. ESPN’s Outside the Lines program is also digging into the sports scandal. 6. There’s a catch to AT&T’s new GigaPower high-speed Internet service. For consumers who allow the company to track their Web browsing, the price is $70 per month. But it’s $29 more for customers who opt out of tracking.